Snow! 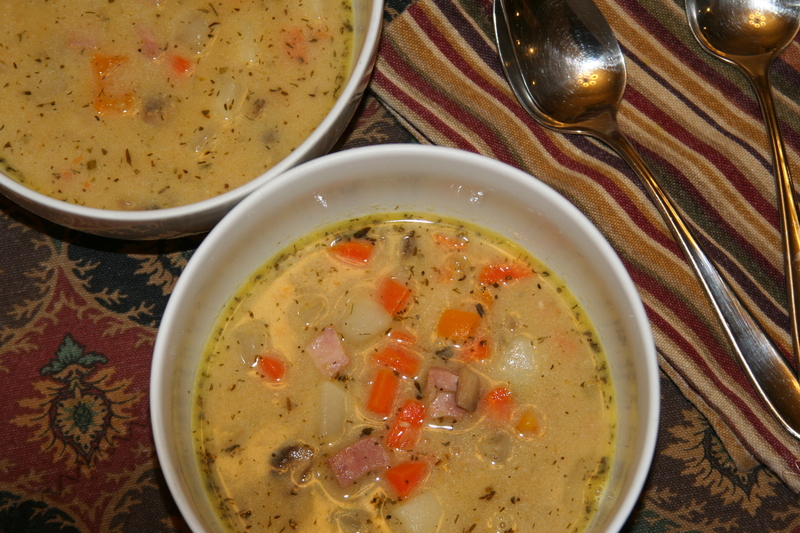 We are in the midst of our first real winter weather here in Pueblo and, while I already miss the long, lazy days of summer, I do love soup and stewed dishes so I plan to focus on the positive and get cooking. Our winters in southern Colorado don’t compare at all to what happens in other parts of the country. Generally, like now, we get a dusting of snow and it doesn’t stick around for very long. This cold front was a bit of a shock to the system, though. On Tuesday, I enjoyed my lunch outside in the sunshine, relishing the gorgeous 70 degree weather. About an hour later the wind was terrible and the temperature had dropped 20 degrees. Now it won’t get above freezing. Extreme shifts in temperature are common for Colorado, but I really wasn’t quite ready for it yet. I still had plans for hiking and running in the fall sunshine. Luckily, there will still be lots of occasions for that because this can’t last too long. For now, though, it’s cold! So what’s a girl to do? Well I made chowder. I like my chowder with lots of veggies, of course, while my son chose to pick out all the chunks of ham and eat those. One day I’m convinced he’ll like vegetables just as much as I do, but I’m not holding my breath for it! This is a comforting bowl of creamy, salty, smoky deliciousness, just perfect for a chilly day. I cut everything into fairly small chunks so this chowder came together quickly. The next time a storm blows in, consider warming up with a big bowl of this and maybe a glass of wine. I promise not to tell. 2 turnips, total about 3/4 lb. 1) Gather all of the vegetables together. Peel the carrots and turnips and chop everything into 1/2 in. pieces. 2) Melt coconut oil (or other fat of choice) in a large soup pot over medium high heat and sauté the vegetables with salt until beginning to soften, about 7 minutes. 3) Add the ham and herbs and stir everything together. Then add the stock and bring to a boil over high heat. Reduce the heat to medium-low and allow to simmer for about 20 minutes. 4) Once the vegetables are soft, scoop out about a cup of veggies and broth and puree (I used a Magic Bullet for this). Add it back to the chowder, pour in the coconut milk, and simmer vigorously for about 10 minutes. 5) Taste to adjust the seasoning – if the ham is salty, skip any additional salt. Serve in large bowls with lots of freshly ground pepper. This soup is everything that makes me think of spring. It’s light and delicate, just like the first flowers peeking out. It’s simple, with very few ingredients to distract from its beauty. And it’s easy – but maybe that’s just my requirement for spring! This is sort of like a cream of celery, only it’s so much lighter. It’s a starter, not a main course, but I found myself wanting to drink it like tea while I went about my day with the birds chirping in the background. I think it would also be delicious next to a few fried eggs in the morning except that I’ll have to make another batch to try that because this one is all gone! 1) Cut off the root end of the leek, slice lengthwise down the middle, and then cut the white and tender green parts into 1/4 in. thick half-moons. Place these in a bowl of water and swish around until all the dirt is gone. Strain. Slice the celery into 1/4 in. pieces. 2) Heat ghee over medium heat in a medium pot. Sauté the celery and leek with the salt for 5 minutes. Add the chives, tarragon, coconut milk, and broth. Bring to a boil and then reduce heat to a simmer for 20 minutes. 3) With an immersion blender, puree the soup until smooth. A Vitamix or high-speed blender would work well here too. 4) Taste to adjust seasoning and then sip with pleasure. I fell in love with the purple sweet potato because purple food is unusual and this food in particular is quite striking. Do you remember the antioxidant anthocyanin that’s found in things like blueberries and purple cabbage? It is present in abundance in purple sweet potatoes too! This fantastic tuber is not only beautiful, but it’s potentially able to help ward off age-related diseases, eliminate free radicals, and reduce inflammation. With all of that going on, I couldn’t resist. First I tried baking it, just to get an understanding of its qualities. It’s less sweet than the orange-fleshed variety and slightly drier, more like the white version. I really liked it with just a touch of ghee and some salt. Easy! Then I got to thinking about a soup because it’s cold out and my Curried Sweet Potato Soup was so good that I felt inspired. A few Facebook fans thought it would be a good idea too so I got back in the kitchen. Here’s the thing, though. 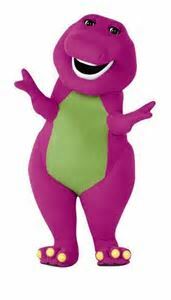 It sort of feels like chomping on Barney. My husband decided it was too weird for him. You’ll have to decide for yourself. At first, I tried different spice combinations but in the end, I went with the simplest of preparations so your taste buds don’t get too overwhelmed – there’s enough going on visually as it is. I asked myself what I liked when I baked it and started there, adding some onion and just a touch of coconut milk. It’s warm and comforting and, well…purple! 1) Melt ghee over medium high heat in a soup pot. Chop onion and add to soup pot, cooking until it begins to soften, about 5 minutes. 2) Peel and chop sweet potato. Add it to the pot and stir to coat in ghee. Add vegetable broth and bring to a boil over high heat. 3) Reduce heat to medium, keeping a lively simmer for about 35 minutes. When potatoes are soft and broth has boiled off some, remove from the heat and blend all the ingredients together until smooth. I used an immersion blender, but any type will do. You might find a few purple splatters as you do this. 4) Add salt to taste, this depends a lot on the broth you use, and the coconut milk. 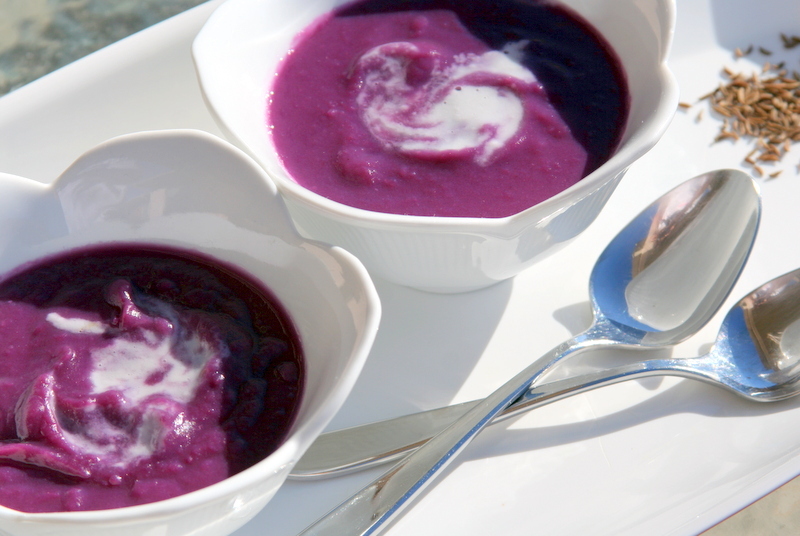 Stir to combine and warm everything up before smiling as you eat your purple soup! There are a lot of reasons to love soup. First of all, it is incredibly nourishing. You can add, fit, squeeze, hide (all depending on whether or not you like your veggies!) so many vitamins and minerals in soup that if you ever made a list, it might look like an 8 year old’s letter to Santa. You can make soups chunky or smooth or somewhere in between and, in my opinion, you can eat them all year round. 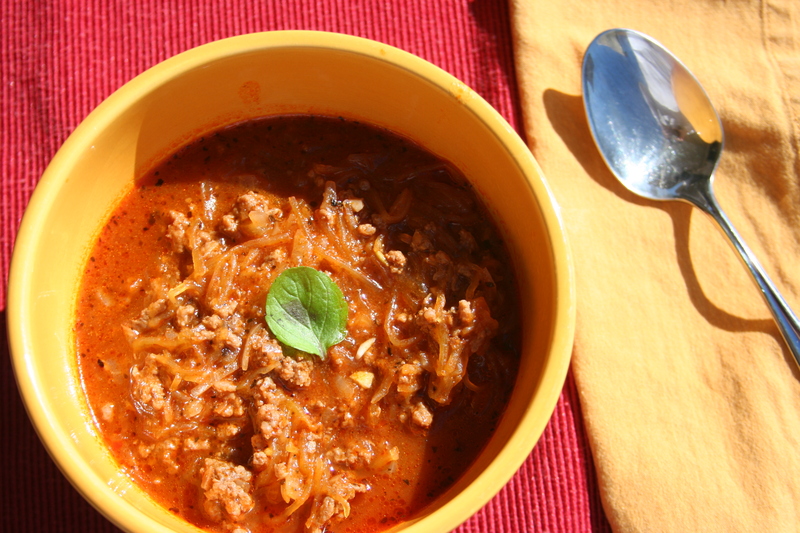 I generally like to keep my soups on the lighter side with mostly vegetables, sometimes with meat, but this time I was looking for something really comforting, almost like a warm, cozy sweater to wrap up in. Let me tell you – this soup is it! It was so good that I immediately froze some so that I’d have leftovers. I’m thinking I’ll break it out on the very next snow day, which happens to be today! Curry powders can vary a lot. Mine is a pretty mild one because I like to have some control over the spice in my dishes by adding additional cayenne or ginger, for example. I used enough to give it a little kick at the back of the throat. Make sure you use a curry powder you like and, if you aren’t sure how spicy yours is, adjust the quantity as you go along. I sure hope you love this soul-warming soup as much as I do! 1) Peel and roughly chop the onion, sweet potato, carrot, and cauliflower. Melt coconut oil over medium-high heat and sauté the vegetables with 1/2 tsp. of salt until they begin to soften, about 8-9 minutes. 2) Add garlic and curry powder and stir for 30 seconds until fragrant. 3) Add stock and 3/4 tsp. salt, if you are using unsalted stock. If you are using commercial stock or broth, wait to salt your soup at the end. 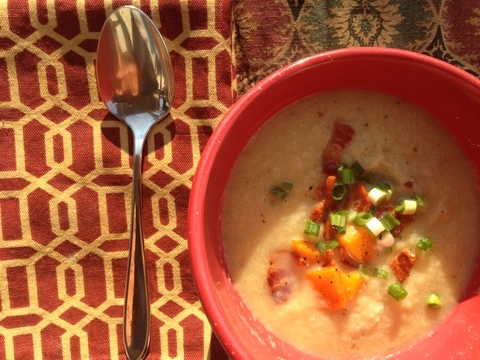 Bring soup to a boil, reduce heat to medium and maintain a rapid simmer for about 30 minutes. Leave it uncovered so that the soup can reduce a little bit while the vegetables soften. 4) Once everything is soft, puree using an immersion blender. This can also be done in a regular blender or food processor, just be careful blending hot ingredients. 5) Add coconut milk, heat through, and taste to see if the soup needs any additional seasoning. Top with chopped scallions and enjoy! 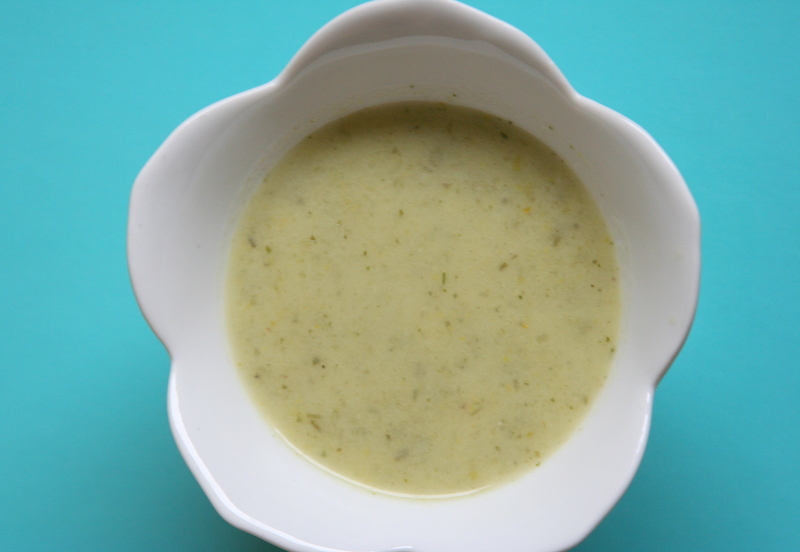 Growing up, I could tell when we were in diet mode because one of the things that would make it on the menu was zucchini soup. We would rave about how low in calories it was – it’s just zucchini and onions! – and how healthy – it’s just zucchini and onions! While it is those things, the actual reason for eating it was that we really, truly liked it. 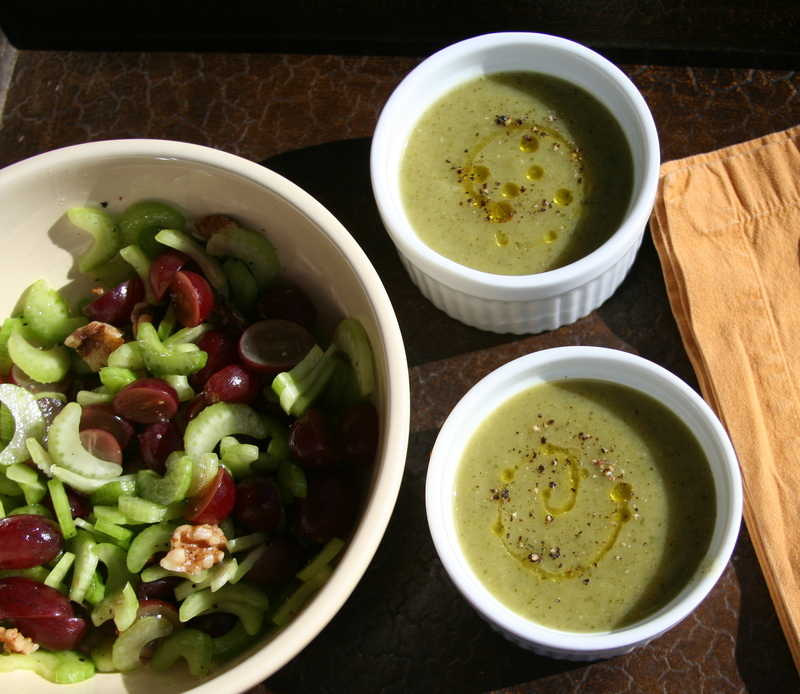 So zucchini soup has always been in my cooking repertoire. Recently I changed it up a bit. I added cumin. This might seem like a minor change, but once you take your first bite, you’ll see that cumin’s warm, earthiness grounds this soup and makes it nearly impossible to stop eating. In each bite, you recognize the cumin, but then you need to take just one more bite because you wonder if, maybe, there’s something else. It seems layered, nuanced. That’s the magic of cumin. 3 medium zucchini, about 1 1/2 lbs. 1) Heat coconut oil over medium heat in a 4-5 qt. soup pot. Add the onion and cook for 3-4 minutes. 2) Cut the zucchini lengthwise into quarters, then into approximately 1 in. pieces, and add them to the onions. Add the garlic and salt and cook for about 8 minutes until beginning to soften. 3) Add the cumin, stir for about 30 seconds, then add 4 cups of broth and bring to a boil. Reduce the heat to medium and cook, uncovered, for about 35 minutes, allowing some of the broth to evaporate and concentrate the flavors. 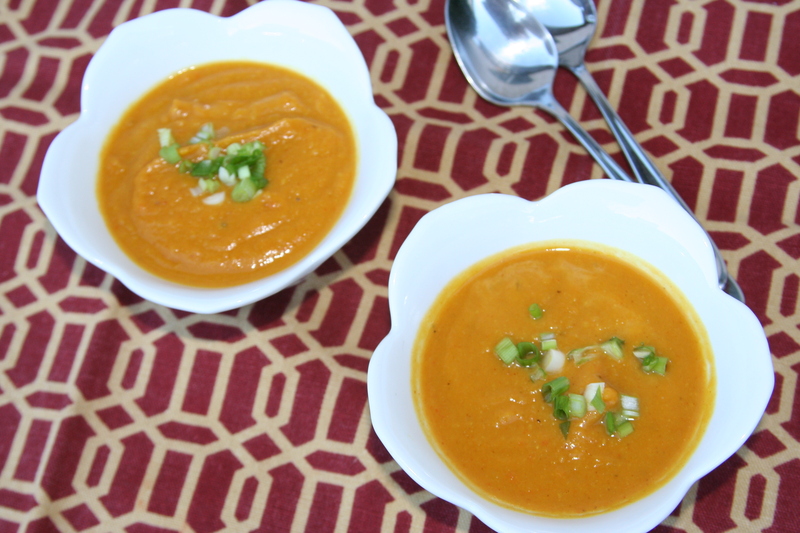 4) Remove from the heat and use a blender or immersion blender to blend the soup until it is silky smooth. Taste to adjust any seasonings and delight in your diet. It’s snowing! It’s not even Halloween and we’re having our first snowfall here. I thought fall was in the air, which has made me crave soup lately, but since it’s apparently winter instead, I went past craving and straight to making. Last weekend, a friend of mine brought some Leek and Potato (yes! real potatoes – shhh…) soup to share and I indulged a bit. 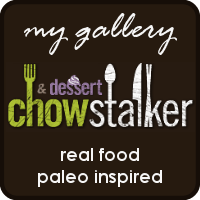 I was reminded how much I love that soup and decided to try my hand at a paleo variation. This one is warm and cozy with a woodsy flavor from the rosemary and I love the sweet pops of roasted squash and crunch from the bacon. I even ate it for breakfast this morning with an egg on top. It was delicious! You can use fresh cauliflower if you want, but this is one of those times that you don’t need to bother. Let me know what you think. 1. Preheat oven to 425. Begin browning bacon in a large pot on the stove over medium heat. 2. While bacon is browning, peel your butternut squash and cut into 1/2 in. cubes. (Or get pre-cut squash to make it even faster!) Take 1 T. of the bacon grease from the rendering bacon and toss it with the squash in a 9×13 baking pan. Sprinkle in about 1/2 tsp. of salt and roast in the 425 oven for about 20 minutes, stirring periodically, until beginning to brown and caramelize. Once done, remove from the oven and set aside. 3. Cut off the root end of the leek and slice it lengthwise. Rinse it thoroughly under water, being sure to separate the layers and rinse out any dirt. Slice the leek halves into crescents about 1/4 inch thick. 4. Remove the now crispy bacon to a separate plate and set aside. Remove and save for later most of the bacon grease in the pot, leaving behind about 1 T. Add the sliced leeks to the bacon grease and sauté until beginning to soften. 5. Add the bag of cauliflower – frozen is fine – to the leeks and add about a 1/2 tsp. of salt. Cook for about 5 minutes. 7. Add the roasted squash cubes and stir to combine. 8. Taste to check for seasoning. You may need a generous amount of salt, depending on the kind of broth that you use. 9. Serve sprinkled with scallions and bacon.